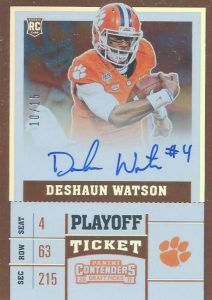 Although it took some time for Deshaun Watson rookie cards to reach the heights warranted by his on-field play, the quarterback for the Houston Texans has shown the same abilities that made him a legend at Clemson. That excitement has now moved to the hobby, and Watson leads the way for the 2017 rookie class. 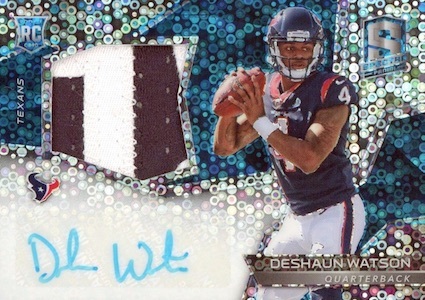 You'd think that Deshaun Watson rookie cards would have started off hot given his back-to-back championship appearances in college, including one title, and a first-round selection in the NFL Draft, but collectors warmed up to the QB rather slowly. Shop for Deshaun Watson memorabilia and apparel on Fanatics. While he did not begin his first NFL year as the starter, it was not long before Watson moved to the top of the depth chart for the Texans. 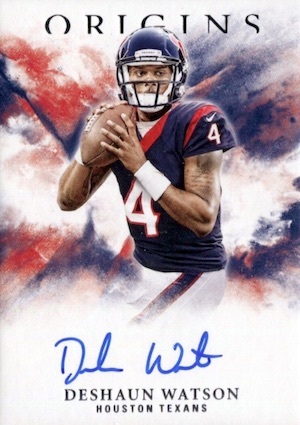 Highlight-reel plays and big stat lines soon followed, as did huge demand for Watson's football cards. 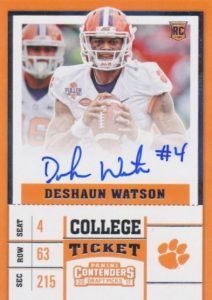 Starting with prospect options and NCAA sets from earlier in the year before moving to NFL sets, Deshaun Watson rookie cards come in all price ranges. The guide below focuses on some of the very best 2017 cards to release so far. Obviously, there are more cards available than what is listed below as nearly every Panini product has multiple choices for Watson. The exclusive NFL card marker, Panini provides a tremendous variety of sets, all which are housed in our 2017 Football Card hub. 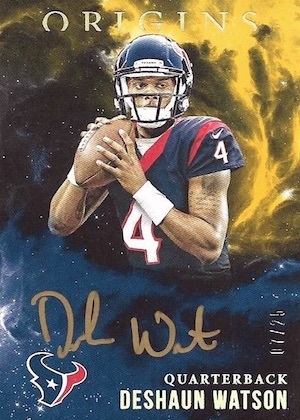 If you want to get a real-time sense of the top Deshaun Watson rookie cards, view his current eBay auctions with the most bids. 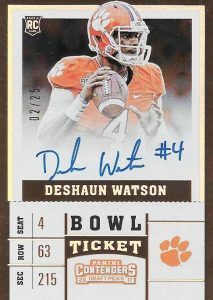 Let us know in the comments if any other Deshaun Watson rookie cards have earned a place in your collection. 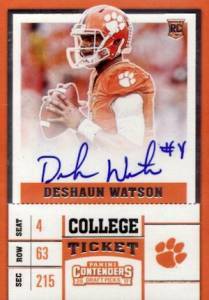 Although it is the second choice for many when compared to the NFL version of Contenders, the college-based 2017 Contenders Draft Picks still holds its own with several hard-signed College Ticket cards for Watson. The base version in a white jersey is a short print limited to 200 copies or less, while the three image variations are super short prints (SSP), with print runs not exceeding 100 copies. There are also several levels of numbered Ticket parallels for each card. A rare early-season NFL set with premium elements, the Elegance rookie subset in 2017 Impeccable features on-card signatures, two relic pieces, and only 75 main copies. While the base pairs a helmet and patch, the more limited parallels up the quality as the print run decreases via Helmet and Nameplate (#/25), Helmet and Glove (#/15) and the one-of-one Dual NFL Logo version. 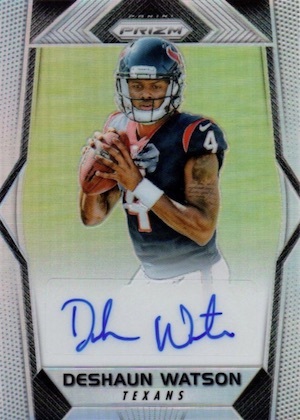 Although the base Rookie Patch Autograph for Watson has a sticker signature, the Rookie Autograph insert from 2017 Origins is signed on-card. As a result, this is arguably the more popular choice. In addition, a version with a darker scheme adds gold or silver ink for the signature. 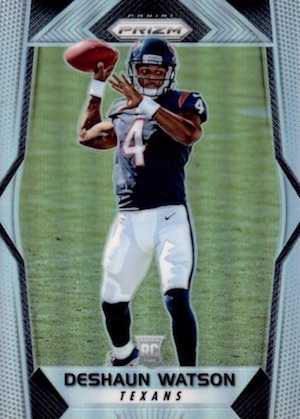 If you want a Deshaun Watson rookie card that looks great, is very inexpensive, and also has more valuable and rare editions to chase, 2017 Prizm NFL might be the right option. 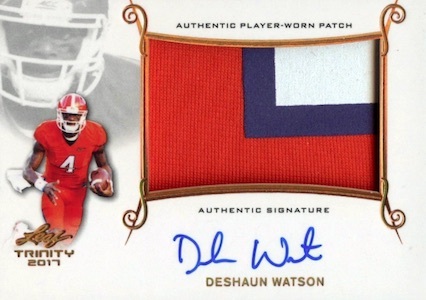 As far as the Deshaun Watson Prizm autographs, you can check out the main signature version or the auto patch with just 99 copies. Matching the color and shine of Prizm, but with a little more in the way of design, 2017 Spectra favors bright and bold over everything else. 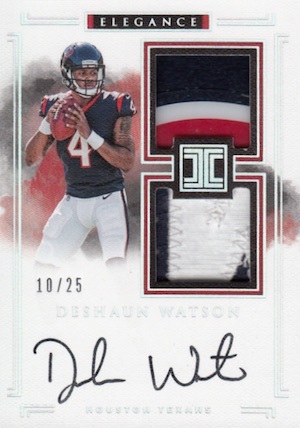 While the Deshaun Watson sticker autograph relic is not much different from many of the other sets that Panini pumps out, the parallels do really catch the eye. Just be ready for the neon explosion. Not licensed by the NFL or NCAA, the various 2017 Leaf Football sets are still worth a look from collectors. Lower production is joined by mostly on-card signatures. Top choices include Valiant and Trinity.